I’m 25, live in Cardiff and currently work 4 days a week in a 9-5 job that doesn’t excite me very much. I’m looking to leave because I want to be more creative. That’s me really. I feel like my ‘talents’ are lost in my current admin position and I want to be able to run with things, work on new projects and develop creative ideas. I am a positive, look on the bright side kind of person, and as cliché as it is, a total team player. I first did work experience at a GP surgery when I was 16 because my Mum worked there and actually, It gave me a good foundation to build my admin skills. After completing a Media Studies degree I walked into a job at a different GP surgery. I then progressed, gained multiple promotions and became a valued member of the admin team. I was one of the ‘go to girls’, able to step into any job, help with any problem and support team members. I stayed for a year and a half, getting used to earning my own money and learning about working life. I enjoyed being a part of a varied team and formed strong personal and professional relationships. In 2016 I found a stepping stone on the ladder to the social media/marketing world which is what I really wanted. I was hired by a very small company as a Social Media Strategist. This involved devising social media strategies for clients, writing, using scheduling tools, creating bespoke content and random bits here and there. I was there exactly a year before being made redundant. Unfortunately the company ran into great financial difficulty, and although I was devastated to be let go and find myself without a job, I was determined to find a job straight away. Luckily for me I had a desirable background in admin and found myself right where I am now. I learnt so much from this experience, and it taught me a lot about hard work in a stress filled environment. Over the last year I’ve realised that now more than ever I crave to be a part of a team where I enjoy what I do. A lot of people say that ‘you work to live, not live to work’ and I’m a believer of this. You just have to love what you do. Over the past few years I’ve come to the realisation that I don’t care how much money I take home every month, or if I don’t leave at 5 o’clock on the dot. I just want to do a job that I love and do it well. If it means working late or taking my work home with me I’m all for it, to better myself, my company and the work that I do. If you take an ‘outside of the office’ interest in your 9-5 then I believe you’ve found the perfect place to be. I strongly feel the need to belong to a team where I can get excited about day-to-day work or activities. I’m keen to have a varying day to day and get to mix and mingle with new projects, people and explore artistic licence. I’m always keen to take on new projects and I believe I can bring this enthusiasm to your team! I’ve always been incredibly creative, I love painting, drawing and doing crafty things. I used a lot of Photoshop with my art when in school and worked with other graphic programmes like Dreamweaver when studying for my degree. You’re looking for someone who is creative, and trust me your brief and I were meant to be! In my spare time I love to ice skate, and like any typical 25-year-old spend time with friends, watching good movies and eating good food. I’m also currently in the process of setting up my own Etsy shop, I’ve really taken to getting crafty and making new things and I’m planning my next blog which is all about creating your own Christmas decorations. 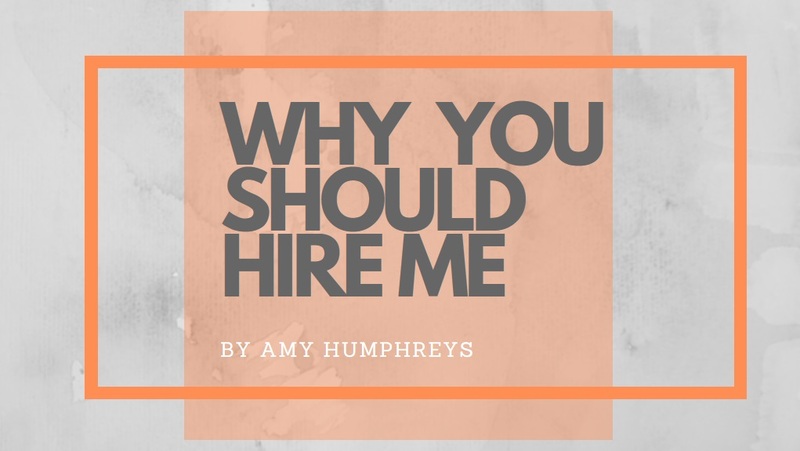 You’re asking for 2 years of marketing experience, and no I don’t have 2 years experience, but I hope that my blog post and CV give me that extra chance to shine. I’m enthusiastic, ready to learn, work and develop skills and strategies both for myself and your company. I have a keen interest in writing, creating content for marketing and being a part of a well working team. Please see my CV for more details on employment history and contact details.